Printable Adhesive is a new to me product, so bear with me while I get to know this project a bit better, I have all kinds of fun ideas in my head of things to create, now that I've had a chance to play a bit. Today, I'm sharing a quick and simple Halloween project using this Printable Adhesive along with some Digi images from MyGraphico. I found some Halloween Digi papers at MyGraphico and printed them with my Ink Jet Printer onto the Printable Adhesive Fabric and let it dry. I used some Halloween images from eCraft Central, cutting the Adhesive Fabric with the eCraft to create some cute decorations. The open spaces on the images are prefect for adding names with a Permanent Marker. 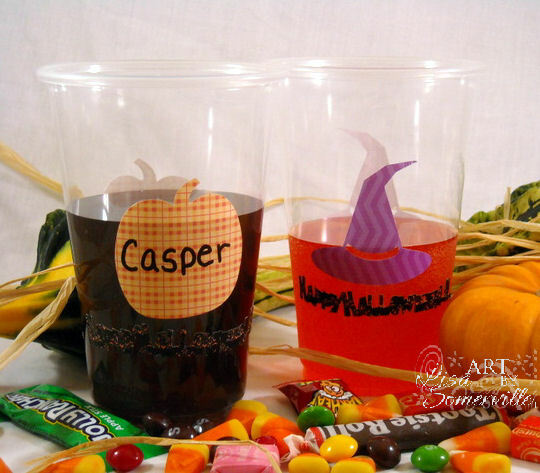 These would be fun for decorating clear treat bags, or instead of filling the cups with liquid, you could put the treat bags inside the decorated cups. 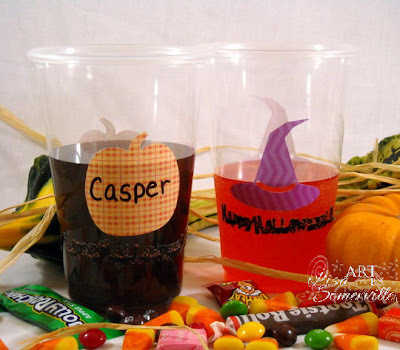 What fun Halloween treat ideas! I can see the treat bags in the cups too! Would be great and easy way to decorate a school party! Wow, great idea and digi papers huh??? YEAH! Fun fun fun, great ideas, need time to play more.